I have to admit, I love monster crafts. I can’t help it! They are super cute, and girls and boys alike think they’re fun too. What’s not to like? What I love about these is that they require so few supplies, and chances are you have them at home if you do basic crafting with your kids. I found an adorable eyeball printable online, but you could even make your own if you wanted to by cutting circles from white and black construction paper. When you are all done making these you can stick them into planters, hang them in the window or have yourself a monster puppet show. Assemble your monsters using Aleene’s school glue. Need another monstrously fun idea? 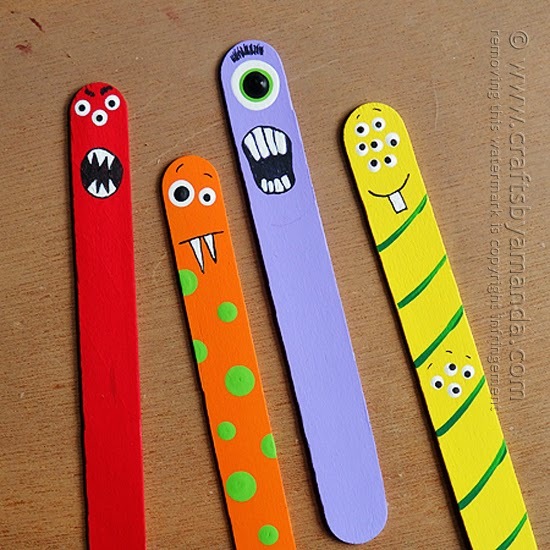 Make these craft stick monsters too!